Milady is cleaning in a silk dress and pearls, thanks to a ” Sweet Home Electric Vacuum Cleaner”. Did you read the headline as a “sweet” Home Vacuum Cleaner? How very modern of you. Actually it’s a “Sweet Home” Vacuum Cleaner. Still, it IS sweet. 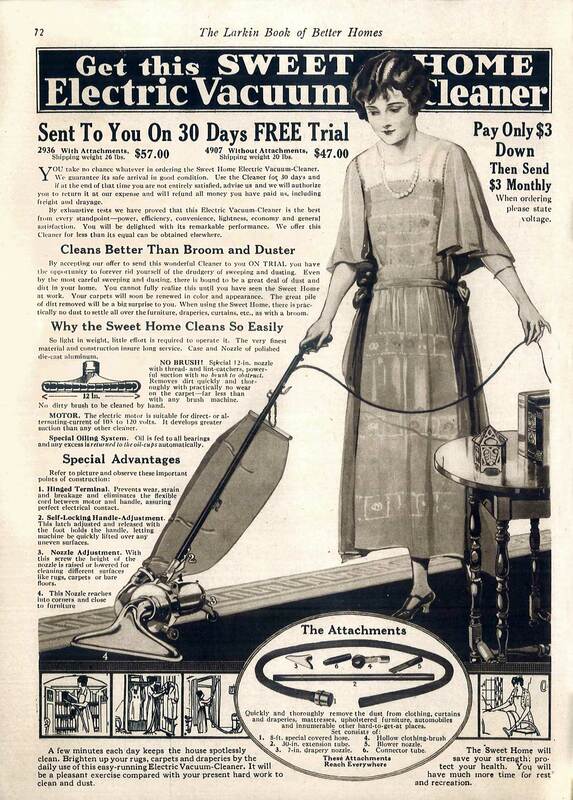 Electric vacuum cleaners were a modern electrical luxury, like radios, in 1924. They’d been invented a decade and a half before, and this model is quite recognizable as a vacuum even today. But oh, the price! 57 bucks – that’s over $1400 in today’s money, well past the priciest Dyson or Roomba. No wonder you could purchase it on installments. The Larkin Company is a forgotten mail order giant. 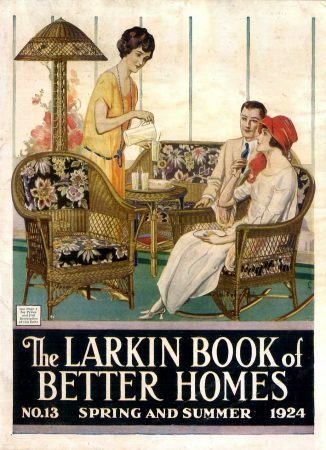 Starting in the late 19th century as the Larkin Soap company, it expanded rapidly and profitably into mail order housewares. Once so big that Frank Lloyd Wright designed their headquarters building, the death of the founder in 1926, ill-timed business expansions, and the Great Depression reduced the firm to a shell of its former self by World War II.